The letter m has always been one of my favorites. 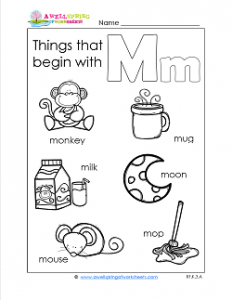 Here are the things that start with m on this worksheet: monkey, mug, mouse, mop, moon, and milk. Kids can practice the /m/ sound several times over. Then, along with you, they can say the words on this worksheet. Where is the m in each word? It’s at the beginning! They can look at the words and find the letter m. Then they can circle them. When they’ve finished they can color the pictures and the letters.